1. 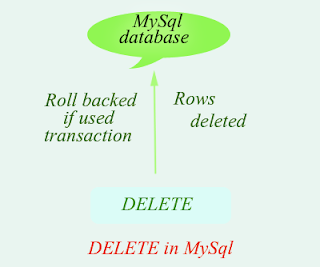 The mysql command 'DELETE' is used to delete space allocated by mysql server and the structure of table remains same. 2. It is removed rows. 3. It can be used by either 'WHERE' clause or without it in mysql. 4. The data can be roll backed, if it is removed by 'DELETE' mysql command. If the transaction is used which is yet committed before delete the row, then you can roll backed again. You can delete whole rows in table. But the structure of table is present in mysql database. 1. Remove rows from mysql table but the structure of table remains same. 2. 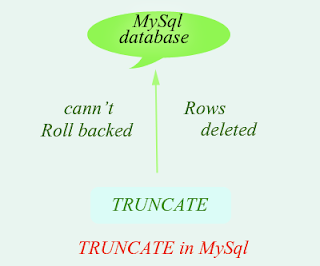 The data cannot be roll backed if it is deleted by 'TRUNCATE' mysql command. 3. It can be used by only without 'WHERE' clause in mysql. 1.Remove whole table from mysql database. 2. 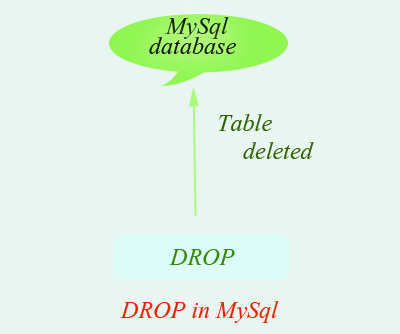 The data cannot be roll backed if it is dropped by 'DROP' mysql command. Now drop a table 'table1' using 'DROP' mysql command.